Teeth become discolored naturally as people age, however genetics, lifestyle habits and health can affect the whiteness of teeth. Tooth enamel is sensitive and drinking strongly colored beverages such as tea, coffee and red wine can darken the enamel. Nicotine in cigarettes sticks to tooth enamel and many smokers find their teeth a darker shade. Enamel that is chipped or fractured will absorb more of the discoloration, leaving your teeth looking yellow and stained. Teeth appear opaque due to the reflective properties of the enamel itself. As the enamel thins with age, teeth begin to reflect more of the inner tooth tissue and gradually lose their whiteness. Excess fluoride and the use of certain medication can also cause discoloration of teeth. 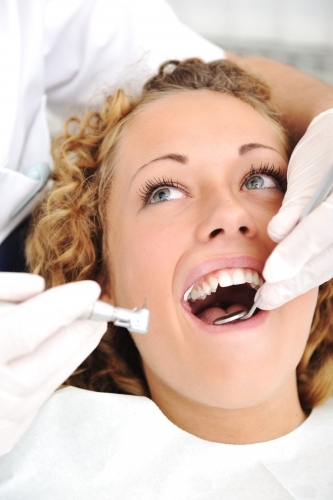 To keep teeth shiny and white, regular dental cleaning and a deep-root scale and polish by a dental hygienist will remove built up plaque and bacteria and prevent teeth discoloring. If regular cleaning does not remove stains or patients want to achieve a Hollywood smile, dentists have various tooth whitening options to cosmetically enhance the appearance of teeth.